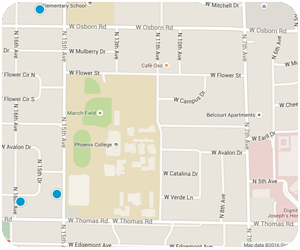 Campus Vista Historic District boundaries are roughly: Osborn to Thomas, 7th Avenue to 15th Avenue. Phoenix College opened its ‘new’ campus on the edge of the city (15th Avenue and Thomas) in 1939. Today it mixes up original brick buildings with modern companions making for a small but pretty college campus in central Phoenix. The homes of the Campus Vista Historic District grew up as a result of the new school, both east to 7th Avenue and North to Osborn. Ranch-style homes, built with the middle- and upper-middle class families of the day in mind, Campus Vista homes typically have 3 bedrooms and 2 baths. That’s a bit roomier than the pre-WW II ranches of Campus Vista’s older “suburban” sisters Fairview Place and Country Club Park. In more recent history, Karia and Tom were looking for a home in the nearby Willo Historic District when they fell head-over-heels in love with their Campus Vista house—a remodeled red brick Ranch circa 1941. It’s one of the older homes in the neighborhood on an irrigated 1/3 acre with mature trees and a pool. They have a hard time leaving on vacation anymore, now that their own backyard offers a personal paradise. Homes in Campus Vista generally range from 1400 to 1700 square feet, typically with 3 bedrooms and 2 baths, and they often have detached garages. The lots average 70 feet wide by 125 feet deep, a bit smaller than Karia and Tom’s, but still generous by historic standards. Inside you are more likely to find tiled or polished concrete floors than wood since these solid ranches were built on a concrete slab foundation. Phoenix College is a quiet presence. Most of the streets run only a few blocks before they bump into the campus, so the neighborhood traffic is pretty sedate. The North Encanto Historic District neighbors Campus Vista to the west of 15th Avenue; Encanto Manor and Encanto Vista historic districts lie just south of Thomas Road; and St Joe’s Hospital is to the east of 7th Avenue. The occasional ambulance siren may remind you that the hospital is there. All the homes in the Campus Vista Historic District are walking distance to Phoenix College or to the expansive Encanto Park, and Karia has found the intimate chapel at St. Joe’s to be a small treasure and an easy walk on Sundays. Park Central Mall with its deli and Starbucks, and light rail station, is a 20 minute walk through St. Joe’s medical campus. And when it’s time to stock the fridge, Bashas’ and Safeway are a short drive up 7th Avenue. If you are looking for a roomier ranch-style home and a larger lot with a variety of amenities nearby, there is a lot to recommend the Campus Vista neighborhood. Phoenix College offers two year degrees. It also offers community theatre troupe productions, a culinary café, a fitness center, musical events, etc., etc. 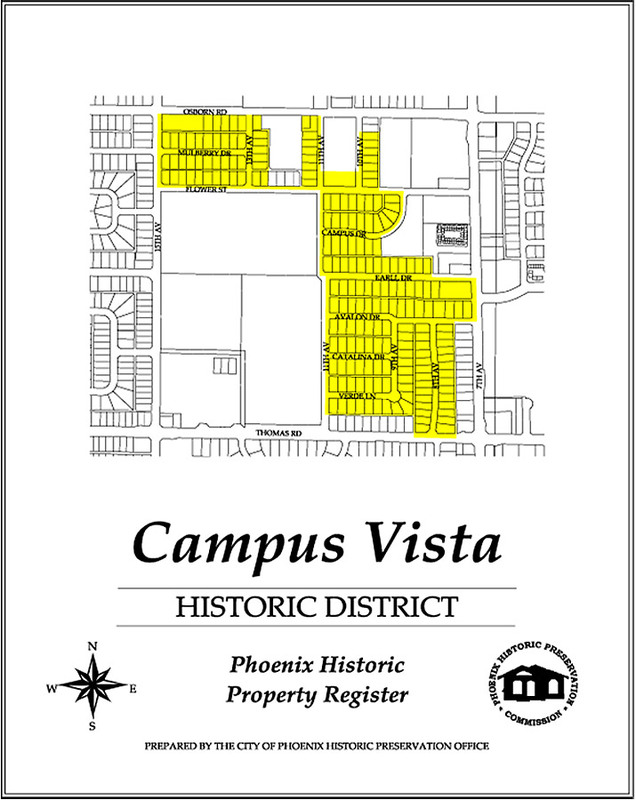 Click here for more info..
There’s more history of the neighborhood in the successful nomination of the Campus Vista Historic District to the National Register of Historic Places: See it here.